Venice Beach Pub Crawl is Today! - Yo! Venice! Home Venice Beach California Venice Beach Pub Crawl is Today! Venice Beach Pub Crawl is Today! The sun is out! 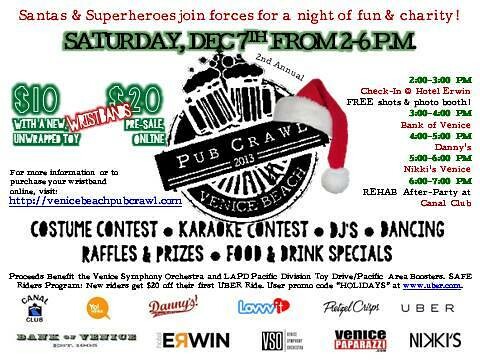 Head down to Windward Circle for the 2nd annual Venice Beach Pub Crawl! Dress up in your seasonal best, or as a super hero for the heck of it! The pub crawl will start at 2 pm at Hotel Erwin located at 1697 Pacific Ave. Participants will rotate locations every hour on the hour until all stops are complete at 6 or so pm. Stops included on the bar crawl map are Bank of Venice, Canal Club, Danny’s, and Nikki’s. Proceeds will go to this year’s selected charities which are the Venice Symphony Orchestra and the Muscle Beach Toy Drive. Participants will enjoy exclusive access to each venue, food and drink specials, raffle items, a costume contest, karaoke contest, DJ, beer pong, and photo booth hosted by Venice Paparazzi. Wristbands can be purchased online for $20 or $10 with a donation of a new, unwrapped toy. You must be 21 years or older to attend. To stay connected leading up to the event and on the day of, find the crawl on Twitter by using handle #VBPubCrawl.